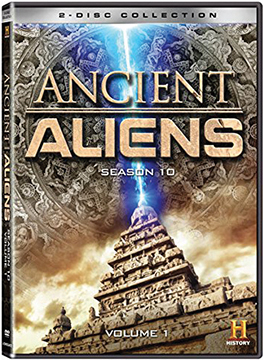 In Ancient Aliens: Season 10, Volume 1 we uncover more astonishing new evidence of extraterrestrial intervention on Earth than ever before, including an aluminum object that resembles the foot of a lunar lander... but inexplicably dates to over 40,000 years ago. In India, a thousand-year-old mask is discovered that looks identical to the face of a grey alien. Newly uncovered records from Russia indicate that in 1948, an ancient rocket was discovered in Kiev. Is it possible that we are on the brink of a reconnection with our alien ancestors? Includes interviews with David Hatcher Childress, Giorgio Tsoukalos, Erich von Daniken, Mike Bara, William Henry, Linda Moulton Howe, David Wilcox and many others. October 20 release. Pre-Order Now! ANCIENT ALIENS SEASON TEN VOL. 1. 2-DVD Set. 334 Minutes. 2 DVDs in Box.